First of all, thank you so much for taking some time of your busy schedule to answer some questions. You recently released your third studio album called Daze of our Lives on Suntrip Records. Could you tell us a little something on how this album came together? Jannis: Thank you, it’s my pleasure :-) I have been working on this album for approximately two and a half years. I refined and modified the tracks a few times. For the better I hope :-). With my previous albums Sky Input and Heliopolis, there wasn’t any real concept. It was simply eight tracks that we thought sounded good individually. The aim this time was to do a more complete and coherent album. For instance In The Heaven’s Eye has a three and a half minute ambient intro. One of the reasons I made the intro so long was to let the listener rest the head/ears before going to the second half of the album. This track is strategically placed as the fifth track just for this reason. People can now listen through the entire album without any break, unlike Sky Input which was too much for some. I ended the last track with the same melody/sounds as the first track begins with. If your stereo is on repeat, you restart the album rather smoothly. I would also like to add that I tried to bring the “goatrance” to 2009. 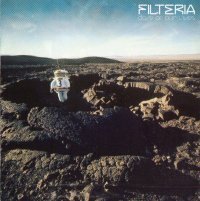 My first two albums were very old-schoolish, while new tracks such as: Filtertraces, Eyeless Observatory and Float Away sound pretty modern in a way to me. I believe that this is my most diverse and by far best work to date. What have been the biggest musical influences besides Goa (naturally)? What would you turn on the moment you come home from a day’s work to relax to? Jannis: I think that emotionally speaking Michael Cretu and his early Enigma productions had a big influence on me. I always wanted to bring feelings to the listener just like that music did to me. Musically speaking, I got inspiration from everywhere, but mostly synthmusic from the 80s. Early trance music such as K.L.F., Dance 2 Trance and Jam & Spoon and some E.B.M. (lovely thick chorus bass lines). I listen to all kinds of music at home. But I would say that reggae/dub, rock, new age and 80s music in all forms is what usually plays in the background at my place. So what is it about Goa trance that holds such an appeal for you personally? Jannis: I think that when you truly love something, trends don’t matter. You just follow the heart. I kind of grew up on this music, so I will always have a soft spot for Goa Trance. Besides the gorgeous melodies, sounds and creativity in this music, there was mysticism which is beyond words. This mysticism is what makes Goa Trance truly special, in my opinion at least. Tracks like Pleiadians’ Maia, Man With No Name’ Lunar Cycle or Transwave’s Land of Freedom make me feel so different, so happy, so strange and wonderful at the same time. Isn’t that every artists dream? To touch the listener in such ways? Your production technique has progressed quite a lot since Sky Input. Do you feel that the need for ultra crisp production technique is something which can pose a threat to the scene as the focus might be too much on technique compared to creativity and quality of music? Jannis: I personally prefer something more alive, organic and dirtier than today’s “perfect” and sterile computer productions. For me productions like: X-Dream’s Radio, Etnica’s Equator, Hallucinogen’s The Lone Deranger or Kox Box’s Dragon Tales are far superior to most computer productions today. But that is simply taste. So the crisp production itself is just a matter of taste. But when production is the main focus and getting more important than the actual music, then I see some serious problems. A crisp production will rarely touch the listener, but the music will. The obsession with production today is simply TOO much and left the music behind. So in our scene this is definitely a threat. There should be a balance. Personally I think the rule should be: Music first, then production... Seems it’s the other way round. The cover to your new album, compared to your previous albums, is something entirely different. Ola Björling did an amazing job on the cover, and appears as well on the track Infinite Regression. Could you tell us a bit about how the choice for this album cover came to be? Suntrip Records is on the forefront of the resurrection of Goa Trance these past few years, and it seems that the so called ‘New School Goa’ is gaining a lot of momentum. More and more people long for the days of wonder and amazement of the first days of Goa, and increasingly more artists are answering the call. How do you expect the Goa Trance scene to evolve over the coming years, and what place does Suntrip have in this future? Jannis: To be honest, I haven’t thought much about the future. I’m just happy that the there are more releases now. I hope it won’t become generic and that artists are not afraid of experimenting with new sounds while maintaining the old vibe. As for Suntrip’s place, I’m sure and hope they will continue like they are doing and keep delivering good material. Within any scene, there is bound to be some talent who, when looking backwards, can be numbered among those who has defined the scene with their sound (e.g. Hallucinogen, Pleiadians and others for Goa, Shpongle, Shulman and some others for psy-chill, etc). Who do you consider the artists to keep an eye on for the future to drive the scene to the next level (besides yourself naturally)? Jannis: It’s kind of hard to answer since I rarely listen to new trance. It’s impossible to follow all these new releases. But the next artist/s that become very popular and creates something “new” also creates a new subgenre because so many other artists jump on the bandwagon and start “copying” that particular style. But I really have no idea who artist that will be. Time will tell. Besides the now renowned project Filteria, you are also responsible for K.O.B (Kind of Behaviour), under which guise you have released several tracks so far. This project seems to have been flying under the radar so far. What are your plans for this project? Jannis: I was going to make an album for this project, which I did, but the truth is I didn’t think the music was good enough in the end, so I decided not to release it. However we are thinking of maybe releasing the best tracks digitally on Suntrip’s homepage. I can add that I played twice last month with this project and there were moments when I felt kind of insecure while I was on stage. Like: what was I thinking while making this? :-) The music requires the proper mood and it’s probably too weird for the dancefloor. To sum it up: K.O.B. CD is not ready, and most probably never will be… That’s at least how I feel now. There are a couple of artists in this scene who have their own distinct sound and whose style might be a good fit, or perhaps a nice counterbalance to your distinct style. Is there any artist with whom you’d like to collaborate on a track or even an album? Jannis: Sure there are plenty of them. In no particular order: The Green Nuns of the Revolution, Etnica/Pleiadians, X-Dream, Hallucinogen, Hux Flux, Procs, Logic Bomb, Transwave, Son Kite, etc. Basically people who I admire for their music, who inspired me and that I believe I will learn from. Besides the distinct Goa tracks we’ve come to enjoy from you, there’s also been some ambient/psy-chill output from your studio. Is there any chance we can expect a downtempo album from you anytime soon? Jannis: I haven’t thought about an album, but who knows? :-) Maybe in the future. I would like to make some freestyle downtempo stuff… I have bought new equipment in the studio so I am feeling inspired to work with pretty much anything for the moment. The coming festival season is right around the corner. Are there any events you are particularly looking forward to? Jannis: I am looking forward to pretty much all of them. In less than two weeks there is the Urban Art Forms Festival in Austria. Later there is Aurora in Greece, Bakony Festival in Hungary which I will be opening up and I also look forward to my first Antaris-Project in Germany. And Japan in early September should be something special! Looking back on the past years, are there any things you would’ve done differently (like producing pop anthems for Britney Spears instead of Goa Trance)? Jannis: Since I always wanted to bring those magical moments to the listener like Goa once did to me, I am 100% sure that I made the right choice. I find it very rewarding to see people smile and dance. It’s an amazing feeling and I wouldn’t have changed that for the world. Even if I enjoy pop music (not necessarily Britney Spears), it never managed to touch me in the way most electronic music did. In short: I’m enjoying my life and I’m happy the way everything turned out up till this day, so I’m convinced I chose the right path so far. Anything you want to share with those reading this interview? Jannis: Be the change you want to make! Never stop searching for the music that is right for YOU, and if you can’t find it – make it! I am eternally grateful for all the support I am receiving :-) Check out the new album! For contact, future gigs, booking gigs etc.